The first tour in Australia where you can now Swim with the Australian Sealions and then shark cage dive with the magnificent Great White Sharks all in the same day (at two different locations) saving you both time and money! Operates between the months of October and May. Tours are not operated every day as we are committed to minimizing the impact to the Sealion colonies we visit. Please check our calendar for availability or contact our office. After departing the Port Lincoln Marina enjoy a boat cruise to the days lunch stop. Upon arrival at either Hopkins or Grindal Island, wetsuits, masks and snorkels are provided and we are ready for the most playful swim ever. One of our crew will be in the water with you at all times. Once in the water, the Sea Lions entice you to come and play. With summersaults and swirls they glide effortlessly past. After approximately an hour of swimming it is time to climb back onto the boat, a hot shower awaits and the coffee machine is ready. From here we head to Neptune Islands Marine Park for an afternoon of shark cage diving. Upon arrival divers are formed into groups and enjoy approximately 30-45 minutes dive time (the same amount of time as the day tour and times vary depending on the shark activity). Enjoy a fully cooked dinner at sea and they enjoy a twilight trip home enjoying a beverage from our licenced bar. A benefit of this tour when it boards at 11.00am is you can fly in the morning of the trip and you are only required to stay the one night in Port Lincoln for the time poor travellers. During some months this tour will board at 6:00am or 6:30am. In this case, the tour will operate in reverse and breakfast is served instead of dinner. All prices are in Australian Dollars (AUD) and include GST (10% GST). Click here for conversion information. We collect a Visitor Use Fee of $37 per passenger/day on behalf of DEW. The Visitor Use Fee is payable by all guests entering the Ron and Valerie Taylor Marine Park (Neptune Islands) on a shark cage diving tour. This fee is used to cover the Government management, research and compliance costs associated with the industry. Since the introduction of our 1-day tours in January 2007, the visitor use fees we have collected has amounted to over $1.5 million. The visitor use fee is mandatory and in no way a donation to research by an operator. 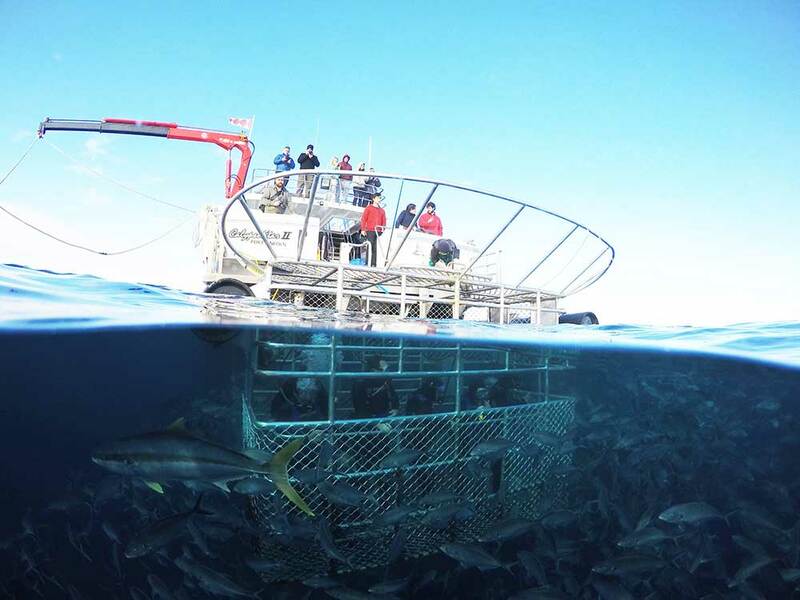 Research - Flinders University is contracted by DEW to conduct ongoing shark monitoring research, the results of which guide industry management and operating restrictions. Funding of this research amounts to around $60,000 per year. Compliance - DEW regularly engage covert observers across all operators who's job is to ensure license conditions are being adhered to. Operators are required under their licence to adhere stringent regulations and must provide a report to DEW regarding the daily activities. This reporting is mandatory and in no way can be construed as research by an operator. Breaches of regulations can result in formal warnings, expiation or suspension or termination of license depending on the severity of the breech. Price includes the use of our wetsuits, hood, boots, gloves and mask. PLEASE NOTE: In the event that we don’t see any Great White Sharks, you will be refunded $100 per person. In addition all adult passengers will be given a $200 voucher (child’s voucher value is $150) to return within a period of 12 months from the date of the unsuccessful tour. Please read our No Shark Policy for all our Terms & Conditions. Seniors Discount of 10% is available upon presentation of a current Seniors Card. Bookings must me made direct with the office to apply, not available on agent bookings. Only one promotional discount will apply for each product. For example with the multiple tour and the seniors discount, only the higher value will apply. The Seniors Discount is not available on charters that operate on Saturday's, Public Holiday's or during the months of December and January. PLEASE NOTE - In the event that the weather conditions are not favourable to Swim with the Sealions, the tour will operate as a Twilight Shark Cage Diving charter. Guests will then have the option to either receive a refund of $145 or choose to join a Swim with the Sealions charter at no charge on another day. Those who choose not to Swim with the Sealions may join the Captain in the tender boat to observe the Sealions. 60 foot MV Calypso Star - the fastest vessel to Neptune Island Marine Park. Please arrive from 10.30am for the 11.00am tour. All guests are required to have checking by 10.50am. Please arrive from 6.00am for the 6.30am tour. All guests are required to have checking by 6.20am. Pre booked transfers from accommodation places are available for $10 per person return. Please make sure this is booked prior to 5.30pm the day before your charter. Children under the age of 8 are only allowed to enter the water at the Skippers discretion on the day. All children under the age of 16 require adult supervision at all times. If they are in the water their supervising adult is required to also be in the water at all times. If the child or the adult exit the water the adult or the child will also be required to do so. Any guest under the age of 18 needs to have their waiver form signed by a parent or guardian. Your camera, if you have one. If you do not we do have GoPros on board you can to hire and a highlights package is available to purchase. Charging cables. USB points are available on our vessels. Comfortable clothing: Remember to pack some warm clothes as it can get cool on the water (even in summer). A warm jacket is a must in winter. Our vessels have reverse cycle air-conditioning for your comfort. Sunglasses: Polarized sunglasses make it easier to see into the water and spot the sharks from on board. Sunscreen - we encourage you to be sunsmart. Space is limited, small bags are appreciated. 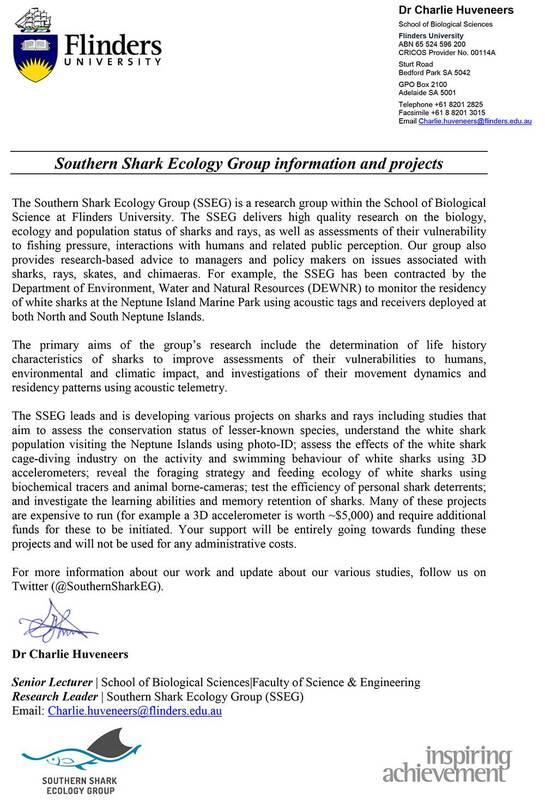 Flinders University's Southern Shark Ecology Group was awarded a Monitoring and Research contract by DEWNR for 3 years from July 2016. This research monitors the visitation patterns and temporary residency period of the sharks that we see. Information is used in the dynamic management of the Shark Cage Diving Industry to guide decisions regarding Non Activity Days. In addition to the contracted research, Flinders University excels in White Shark research and collaborates with research institutions around the world. Calypso Star Charters is a proud supporter of Dr Charlie Huveneers and his team. Charlie is a frequent guest on board our charters, tagging sharks and deploying or retrieving monitoring equipment. We provide shark images that are used in a growing ID catalogue. The high frequency of our charters assists in gaining a better understanding of the visitation patterns as some sharks only visit for a day or two each year. We are proud to pass on your donations to Flinders University to assist funding White Shark research outside of the monitoring program. Our crew will also take photos throughout the day including a shot with our replica jaws, a shot of your group before the dive, an individual shot of you entering the shark cage and other candid shots throughout the day. Please note our crew are not professional photographers. A USB of digital photos is compiled using all good quality photos from the day, along with some great snaps and footage from our archives. A collection of photos from each charter will also be uploaded to our Facebook page. Please make sure you like us to keep updated! Can’t decide what date you want to come? Looking to surprise a loved one or maybe a work or personal farewell gift? Why not purchase a gift voucher. Gift vouchers are valid for a period of twelve months from the date of purchase and can be purchased either by contacting our friendly office staff or directly through our online booking system. Gift Vouchers may be transferred into another person’s name. This is not permitted for the No Shark Policy vouchers. For the transfer to be completed written permission must be received by Calypso Star Charters from the voucher recipient. Vouchers are valid for a period of 12 months from the date of issue. Extensions may be granted by contacting our office prior to the voucher expiry. This will incur a $25.00 fee and the payment of any applicable price rises. As at 1 April 2019, Guests holding a ’Spectator’ gift voucher will need to contact our office to redeem. Vouchers can be cancelled inline with our booking cancellation policy. Once a voucher has been purchased a refund can be issued within the 12 months that the voucher is valid with the payment of a 20% cancellation fee. The refund of the voucher minus any fee forfeited will be provided to the recipient of the voucher. Refunds will be processed via the same method as the payment was received. Available for pre-purchase at our office or through the online booking section of our website or purchase on board. EFTPOS available. We have a Calypso Star Charters Tours App, which can be downloaded to your phone/iPad before the tour. It contains heaps of local information, photos and available in 15 different languages. Please download it before you board. Search the Apple App Store or Google Play for Calypso Star Charters. Or click on the links below to take you direct - Available for Apple and Android users. We are the only operator in Australia that publicises current and historic sightings! CLICK HERE TO SEE OUR HISTORICAL DAY BY DAY SIGHTINGS SINCE JANUARY 1st 2011. Use this to help you decide on the best time to come. As we are dealing with a nomadic creature in its natural environment, we cannot suggest when would be the best time. We provide this information to be open and honest with all our guests to help you make an informed decision! NON ACTIVITY DAYS - Non Activity Days were imposed by the Department of Environment and Water in 2013 as a recommendation by the CSIRO (Commonwealth Scientific and Industrial Research Organisation). They are a strategy to minimise any potential impact on shark behaviour, site visitation pattern and changes to temporary residency period of sharks to Neptune Islands. 4 days per fortnight are designated as Non Activity Days and all one day operators adhere to the same schedule. Everyone knows that when dealing with nature there are definitely NO GUARANTEES. We want to make sure that you are well informed about our Shark Policy and that your expectations are reasonable. We make every effort to ‘lure’ the Great White to us our boat within government specified guidelines however being the wonderful, impulsive & unpredictable creatures that they are we simply cannot change that. The price you pay is purchasing a ticket to join our charter and not a promise of a shark interaction. In the event that we don’t see any Great White Sharks you will be refunded $100. Refunds will be processed via the same method as the payment was received within seven days of a tour. Bank fees and charges incurred through the refund process are at the cost of the guest. In addition all adult passengers will be given a $200 voucher (child’s voucher value is $150) to return within a period of 12 months from the date of the unsuccessful tour. THESE VOUCHERS ARE NOT TRANSFERRABLE TO ANYONE ELSE AND PROOF OF ID WILL BE REQUIRED WHEN YOU NEXT CHOOSE TO BOOK. Please note: The return voucher is a gift to those guests who wish to try again so the next trip is at a reduced price. The vouchers are not a compensation for the first trip to be cheaper and this is why they are not redeemable for cash or transferable. If no sharks are sighted on the second trip, a voucher will be issued for the third trip at $100 per person, to come on board as a diver. If you are really unlucky after a third trip you are eligible to come on board for $100 per person as a diver until you successfully see a shark. I don’t have a diving qualification, am I still able to do a shark dive? experienced divers and veterans of the cage. They are more than willing to help young, old and less confident divers in the cage. I think I might get sea sick. What should I do? The night before your charter avoid excessive alcohol consumption and get a good night sleep. Many seasickness remedies are available; please consult your pharmacist regarding the best one for you. From experience we have found that taking a tablet the night before departure, in addition to one in the morning, is most effective. During the voyage, get as much fresh air as possible. If you are starting to feel sick avoid reading or watching the TV and instead get some fresh air or try to sleep. MV Calypso Star 2 is gyroscopically stabilized, which reduces vessel roll, reducing seasickness and dramatically improving the comfort of the tour. We sell Travacalm on our vessels and from our office. Please ask the crew when you board. Berley is a finely minced mixture of natural fish product introduced into the water, the smell of which attracts sharks. Sharks are naturally attracted to the Neptune Islands due to the year round presence of a 40,000+ colony of Long Nosed Fur Seals. Berley is only effective in attracting sharks to the vessel that are in the immediate vicinity of the Neptune Islands. Sharks are a nomadic animal that visit Neptune Islands to feed on Seals. We freshly source tuna guts and gills which are a by product of the local Southern Bluefin Tuna industry. The offal is minced and quickly frozen to maintain freshness. Our berley is stored at –20C and naturally thawed prior to use. When used onboard, the berley is heavily diluted with seawater and used sparingly. At times of good shark activity around the vessel almost no berley is used. The continuity of a berley trail is more important than the quantity of berley used. The trail is dispersed through the water column with the wind and tide. We use a tethered bait consisting of a tuna gut/gill attached to a floated line to draw the sharks closer to the cage for an enhanced view of the sharks. Great care is taken to minimise the instances of sharks consuming the bait or coming into contact with the boat or cage. When sharks are present, the bait line is tendered by one of our experienced bait handling crew. Concerns regarding the use of bait and berley to attract sharks have been met with our conscious effort to reduce the quantity that is used. Over the past 5 years we have been able to reduce the average quantity of bait and berley that is used by 15% while increasing our passenger numbers by over 30% in the same period. We work closely with the Department of Environment and Water who manage the industry to ensure best practice standards are achieved and that a sustainable and safe industry is maintained into the future. No. Decoys are NOT permitted to be used by any operator in South Australia as part of Government licensing conditions. We only use locally sourced, natural fish product to attract the sharks, our tethered baits are attached by natural fibre twine. Our practices are conducted with the utmost respect to the welfare of sharks. Do you offer a spectator price? The price of our tours is the same for all guests as when a shark is sighted, everyone on board has the opportunity to view the shark, not just those in the cage. We encourage all guests to dive in the shark cage and respect the wishes of those who prefer to watch from the boat. If a shark isn’t sighted, we offer a $100 refund to all guests and a discounted return ticket as part of our No Shark Policy. How long do I get to spend in the cage? It depends on the shark activity on the day. Our crew strive to give each guest the same amount of shark interaction on the day which does not relate to time or number of dives. On average (which is not definite) it works out to be around 30-45mins. Can I get a senior's discount? Yes you can. Upon presentation of a current Seniors Card you will receive a 10% discount of the recommended retail price. Bookings need to be made direct with the office. It depends on the time of year you wish to book. The summer months of December to February traditionally book out nearly every trip. Also weekends are very popular throughout the year and generally fill up quickly. We suggest that if you do have a specific date in mind to book it in just to make sure you do miss out. You can always check out our charter calendar which also lists the seats available to keep up to date with the availability. What is the best time to view the sharks? Due to the nomadic habits of Great Whites, the best time does vary year by year. They have been elusive at various times throughout the years. In the past 11 years there is no particular month/season that has consistently produced no sharks. On average we have calculated that you have an 85% chance of sighting sharks at any time of year. To assist you with making your decision, we recommend you visit the shark sightings page on our website for full information on all charters from 2011. Our sightings page shows only sightings of Great White Sharks. Sightings of Mako and Bronze Whaler Sharks aren’t included in the overall daily tally. Will I be guaranteed to see a shark? And if I don’t see one will I get a refund? We cannot guarantee seeing a shark as most people can appreciate. We cannot restrict them in any way to stay put but we can surely do our utmost, within specified guidelines, to entice them to the vessel. If a Great White Shark is not sighted throughout the day you will receive a $100 refund. All guests receive a $200 voucher (for adults) or a $150 voucher (for children) to use towards another charter with us. If you do choose to use the voucher towards a Swim with the Sea Lion tour the difference in the ticket amount is forfeited. These vouchers cannot be exchanged for a refund or redeemable for cash. If after your second or subsequent attempts you still do not sight sharks you are given a voucher to return for $100 all inclusive. Proof of identity will be required when redeeming the voucher. The short answer is: No. The long answer is: The use of drones within Marine Parks and Conservation reserves (all the islands we operate ) is prohibited unless with a permit. Permits can be obtained from the Department of Environment and Water (DEW) but depending on the location, the presence of some species of birds will prevent this for most months of the year. If you obtain a permit (Permit applications are about $200 and you'll need to be licensed by CASA and hold insurance which indemnifies Calypso Star Charters and DEW) against damage to people and property then please contact us directly to arrange. I am a commercial photographer, do I need a permit? Any guests who receive a fee or reward for their photography will need to contact the Department of Environment and Water (DEW) to enter into a commercial filming agreement (in many instances this is free of charge). Please direct all enquires to DEW Parks Licensing Officer, Shez Hobbs - shez.hobbs@sa.gov.au or phone (08) 8204 9060. A commercial filming agreement takes 1-2 weeks to process. Can I do the dive if I have asthma? We recommend that you consult with your doctor as the severity of asthma does vary. Be mindful that the shark cage sits immediately behind the boat with 40cm of the cage above water level so it is very easy to surface and exit the cage at any time. When standing in the cage, a diver's head is approximately 30-40cm below the surface. We suggest that you speak to your doctor regarding whether or not you can join us on board and let them know you will be diving about 50cm below the surface. As each pregnancy is different we cannot say yes or no. If your doctor is happy for you to come on board so are we! Please also speak to your doctor about seasickness medication. There are some remedies available for pregnant women to use. As it is a full day at sea, we do highly recommend all guests to take seasickness precautions. What is the water temperature? Will I freeze? The Neptune Islands are located 15 Nautical Miles from the mainland. The water depth surrounding the islands is 90+ meters. This keeps the water temperature fairly stable (a cold snap in winter won’t be reflected by colder than usual water). The water temperature varies between 18-20C in summer, down to 14C at the end of winter. We provide 7mm wetsuits and booties year round with hoods available in the cooler months. Our vessels are fitted with hot showers. We do not have an age limit to board our tours, but do have additional conditions for people under the age of 18. Our child prices are for ages 16 & under. Please book all children under the age of 8 on as a Spectator and if they are permitted to dive the $100 dive upgrade is payable on the day. What size wetsuits do you have available? We carry a large range of wetsuits and sufficient quantities to generally ensure everyone gets their own wetsuit. Sizes range from Extra Small to 5XL in 7mm plus kids sizes and XXXL Super Stretch in 3mm. Dress/shirt sizes are a comparative guide for wetsuits. A 3XL 7mm wetsuit will general fit a person of up 130kg, the Super Stretch 3mm suits are incredibly stretchy, however, the water temperature from November to May is generally such that the dive can be done in shorts and a shirt. You are welcome to BYO wetsuit if you would prefer. What is the visibility when diving? The Water clarity at the Neptune Islands Marine Park is usually very good, often more than 25m. Rough weather does reduce the visibility slightly, but rarely below 15m. We have a number of dive sights located around the islands, which allows us to select the clearest water and best shark action possible. I don’t have an underwater camera, what are my options? No problems! We understand that underwater photographic equipment is a significant investment, especially if you will only use it a couple of times a year. We offer a ‘Highlights Photo Pack’, which is a USB of the day’s events including underwater still shots if taken on the day. The USB also includes a large range of great stock photos and footage from our extensive photo library. GoPro cameras are available to hire with 8Gb and 16Gb card options. I wear glasses, do you have special goggles? We have a range of masks on board with negative corrective lenses available for loan on a replace if lost/broken basis. Please ask the crew on board. Swimming ability isn't required as divers are weighted to overcome the buoyancy of the wetsuit and simply stand in the cage with the water level approximately 30-45cm above their head. Training is given on board to assist divers to use the 2nd stage dive regulators to enable them to breathe underwater. Moderate fitness is required as entry/exit from the cage is via a ladder. Viewing of the sharks from the surface from onboard the vessel is also possible. If a customer wishes to cancel a charter for ANY reason once payment has been made a 20% deposit will be lost if the cancellation is received more than 48 hours prior to the scheduled departure. If a customer wishes to cancel a charter less than 48 hours prior to departure once payment has been made 100% will be lost. You can reschedule or postpone your charter without incurring a fee prior to 7 days before your departure time. Within 48 hours does incur a 20% fee. Do you have a question we have not answered on our website? Can you please email us the question so firstly we can answer it and secondly maybe add it to the FAQ's for other people who could be wondering the same? Thanks! The Sea Lion tour takes place at offshore islands within Spencer Gulf. We operate to the sheltered side of the island however depending on the weather conditions some moderate wave motion and a current may be experienced. Swimmers wear a wetsuit for buoyancy and warmth and some snorkelling experience is preferred. The ability to tread water for 5 minutes and be able to swim the length of a pool is essential. A crew member/s accompanies guests into the water and our tender vessel is on hand to swiftly assist in an emergency. December though to April increases the chances of really nice weather and light winds. How long do I get to swim with them for? License conditions restrict the amount of time we can be present at the island. Swimmers can expect between 45 minutes to an hour for swimming. Is interaction with the Sea Lions guaranteed? Interaction cannot be guaranteed, however sightings of the Sealions can be. Unfortunately sometimes they may not enter the water or remain in the water for long periods of time and we cannot force them or coax them to do so. The Sea Lions are wild animals and some days they are more playful than others. In the water they often come within centimetres of you to say hello. The crew will provide you with an information sheet and briefing once on board and advise you of how best to interact with them in the water. One of our crew members will be in the water with you at all times to help you get the most from the experience and of course to ensure your safety at all times. Our charters operate during the months of October through to May. We choose not operate every day. We are the only one day operator who does not visit a specific site more than 5 times per week. We are committed to minimizing the impact to the Sea Lion colonies we visit. Please check our calendar for availability or contact our office. Is there a Code Of Conduct for interaction with the Sea Lions? The tour activity is controlled by the Department of Environment and Water (DEW) and strict guidelines are placed on operators. Calypso Star Charters has a long history spanning more than 20 years of Swimming with Sea Lions at Hopkins Island. Over this time we have developed our own code of conduct for these tours. We consulted heavily with the DEW during the process, which lead to Marine Mammal Interaction Permitting in South Australia. What will I learn about the Sea Lions? Our staff are skilled and have a great understanding of the Sea Lions and the area we visit. All of our Skippers are Eco Guides, Certified by Eco Tourism Australia. The tour is completely interactive and our staff will provide you detailed information about the Sea Lions, the areas we visit and the local Fishing Industry. Hopkins Islands is a protected area as part of the Memory Cove Wilderness Protection Area. Guests are given a detailed safety briefing before entering the water, this covers the conduct whilst in the water with the Australian Sea Lions. We access the area by boat and approach the islands at slow speed to not cause any damage to the seafloor. Our vessel has just undergone a complete repower and refurbishment, careful consideration was given to the engine selection to ensure emissions are minimal. Our vessels are available for exclusive hire for Shark Cage Diving and Swim with the Sealions. Exclusive hire options give flexibility to departure and arrival times, crewing, catering and offer complete privacy to guests throughout the booking process and whilst on board. We offer peak and off peak prices for exclusive hire, please contact our team for more information.